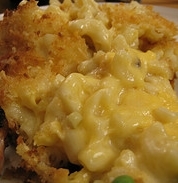 I have an insanely delicious homemade macaroni and cheese recipe from scratch. If you love cheesy, gooey, stringy sauce that wraps around the pasta, you are in for a treat. These recipes rock my friend. Cook pasta until tender, drain. Mix all dry ingredients together, set aside. PREHEAT oven to 350 degrees and spray a casserole dish with vegetable oil. 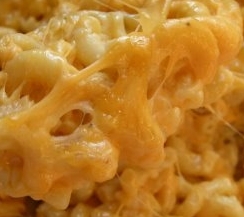 Place half of cooked macaroni in the prepared baking dish. Sprinkle half of the dry ingredients over top and top with half of the butter. Sprinkle 1-1/2 cups shredded cheese over. Repeat with the remaining pasta, dry ingredients and the remaining butter. Top with the remaining cheese and pour milk over all. Cover with foil and bake for 35 minutes. Remove foil, bake an additional ten minutes. Grease a 2 quart casserole dish. Cook the macaroni in salt water according to package directions. Drain well and add to the prepared baking dish. Add butter and toss to coat pasta evenly. Place bread crumbs on a cookie sheet and toast until golden brown; approximately 10 to 15 minutes. Set aside. Beat eggs first and add 1 cup of the evaporated milk, hot sauce, 1/2 tsp salt, 1/4 tsp pepper and dry mustard powder. Whisk to mix and pour over the pasta. Add 3/4 of the shredded cheese and stir to mix thoroughly. Bake for 5 minutes. Bring out of the oven and stir well. Add half of the remaining milk and cheese. Bake another 5 minutes. Stir well and add remaining cheese and milk. Add more milk if it is not moist and creamy. Top with bread crumbs and drizzle with butter. Bake another 20 minutes and serve. The Avenue Bar in Madison, Wisconsin is a longtime favorite restaurant for decades. Welcoming the new addition of executive chef Christopher McKee - the Wisconsin State Journal printed this recipe by Chef McKee. If you are in the area, be sure to visit. Cook pasta in salted boiling water for 10-12 minutes until al dente (tender yet firm to bite). Cool under running cold water and set aside. Melt butter in a saucepan, add diced onions and cook until soft; about 5 minutes. Add flour and stir until a paste forms. Cook for 5 minutes, stirring frequently. Add beer, salt, mustard and stir to thoroughly combine. Whisk in milk, continuing to stir and bring to a near boil (195 degrees) on a cooking thermometer. Slowly whisk in shredded cheese until fully combined. Pour over corkscrew pasta and stir until pasta is fully coated. Place in a greased baking dish. For the topping, combine panko crumbs with melted butter and sprinkle evenly over the top. Sprinkle with remaining shredded cheddar and Parmesan cheese. Place under broiler in oven and cook until topping is melted and lightly browned; about 2 minutes. PREHEAT oven to 350 degrees and grease 2 quart casserole dish. Cook pasta in salted water for 6 minutes; drain and set aside. In a large pot, melt the butter. Whisk in the flour and cook for 2 minutes until smooth. Slowly whisk in milk, garlic and onion powder, grated onion and paprika. Cook for 10 minutes, stirring frequently. Beat the egg in a bowl and add 1/3 cup of cheese sauce; whisking constantly. Add to the mixture and mix well. Add 1 cup of the sharp cheddar and 1 cup of the Colby cheese. Add salt and pepper. Pour in the drained cooked pasta, mix well and place in the prepared baking dish. Top with the remaining cup of Colby cheese. Melt the butter for the topping in a small saucepan and add the bread crumbs. Sprinkle on top of the macaroni and cheese; then add the crumbled bacon. Bake for 30 minutes.